Included in the latest batch of Francis B. Hays scrapbooks from Granville County Public Library is one entirely about North Carolina’s devastation from Hurricane Hazel which struck in October 1954. 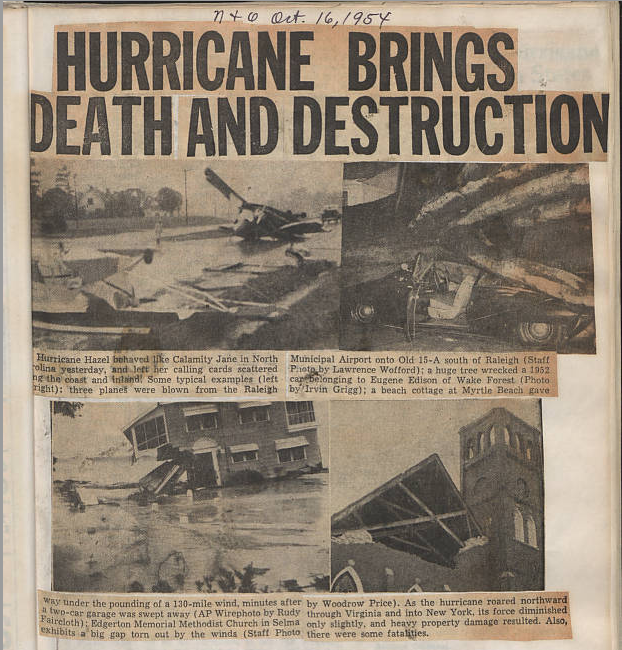 The scrapbook mostly contains newspaper clippings from the aftermath of the storm, which is still one of the biggest hurricanes to ever hit the state. 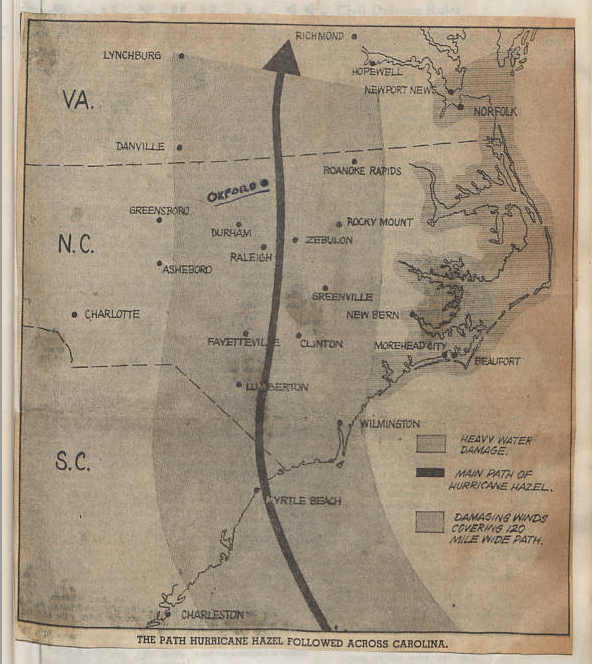 The focus of the clippings are not only on the Oxford area, where Hays lived, but across the state, particularly the Raleigh area and the coast, which were especially hard hit. To see more scrapbooks from Francis B. Hays, visit the exhibit page here and learn more about them in previous blog posts here, here, and here. To see other Hurricane Hazel related materials on DigitalNC, visit here. Some of the marine technology students in the 1970 edition of The Bridge. 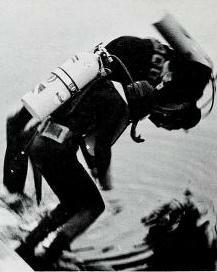 A member of the dive club preparing to take a dip in the 1979 edition of The Bridge. 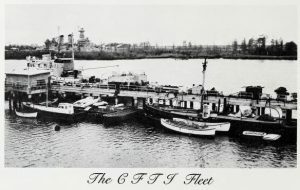 Editions of The Bridge, Cape Fear Community College’s yearbook, are now up on DigitalNC. These yearbooks span 1970-1989, with the 1988 edition covering the institutional name change from Cape Fear Technical Institute to Cape Fear Community College. 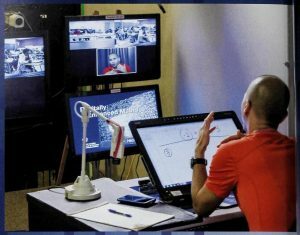 Programs offered by Cape Fear Technical Institute included some specific to the institution’s location on North Carolina’s coast such as marine technology, as well as more traditional programs such as business administration and practical nursing. Cape Fear Community College has grown over the years but continues to offer marine technology, boat building, and boat manufacture and service programs alongside its other academic and vocational programs. Click here to browse through editions of The Bridge. To learn more about Cape Fear Community College, visit their partner page, or take a look at their website. 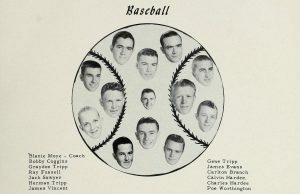 A collage of the baseball team in The Searchlight 1956. 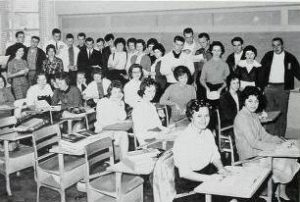 A collage of the junior class in The Searchlight 1956. New editions of The Searchlight yearbook by Winterville High School, located in Winterville, North Carolina, are now up on DigitalNC. They span the years 1956-1958, and were provided by our partner Braswell Memorial Library. These yearbooks feature student and staff portraits, sports photos, and pictures of activities and events. The three yearbooks also include some fun photo collages made by a creative yearbook staff. To learn more about Braswell Memorial Library, visit their partner page and take a look at their website. Why use 1 monitor when you can use 4! — Image from the 2016 yearbook. 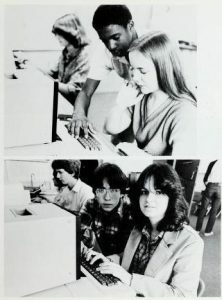 Students in the 1981 yearbook working with personal computers. 34 editions of Odyssey by North Carolina School of Science and Mathematics, are now online. These yearbooks span the years 1981-2016, and document the lives of high school students at the school. North Carolina School of Science and Mathematics (NCSSM) is a two-year public residential high school that serves juniors and seniors from across the state. Located in Durham, North Carolina, the NCSSM curriculum focuses heavily on science, math, and technology. The focus on technology can be seen throughout the yearbook collection, with plenty of photographs of students exploring the newest technology of the day in traditional academic and independent project settings. 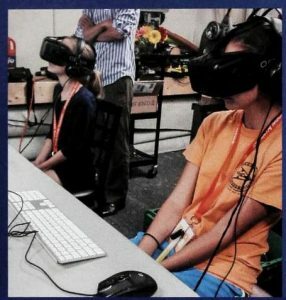 While many images in the 1981 yearbook focus on students working with early personal computers, images from the 2016 yearbook show students engaged with virtual reality and robotics equipment. As students live at the school full-time, there are also many photos of student life including photos of students in front of their dorms and various performances and events. To browse all of the NCSSM yearbooks, click here. To learn more about NCSSM, visit their partner page, or take a look at their website. An advertisement from the 1954 city directory. 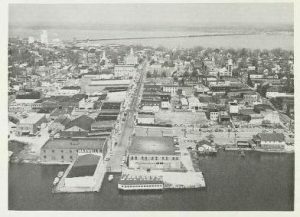 An aerial view of New Bern from the introduction of the 1967 city directory. A new batch of directories from New Bern, North Carolina are now available thanks to our partner, New Bern-Craven County Public Library. These directories are a great source for learning about the population in New Bern, North Carolina from the 1940s through ’60s. These directories provide names and address for citizens and businesses, and are a great genealogical resource. All directories are fully text-searchable and many include buyer’s guides with advertisements and additional business listings. The 1967 edition provides a brief history and introduction to New Bern before the directory information. 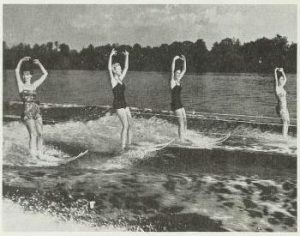 Water skiers on Trent River from the introduction of the 1967 city directory. To learn more about New Bern-Craven County Public Library and see more of their materials, check out their partner page or visit their website. Capping ceremony in the 1960 edition of The Silver Cross. A variety of yearbooks from our partner Burke County Public Library are now online. This batch includes the 1960-1963 editions of The Silver Cross by Grace Hospital School of Nursing, the 1958 edition of The Jacket by Olive Hill High School, the 1953 and 1967 editions of Belles Memoirs by Oak Hill High School, the 1967 edition of Cat’s Tale by Morganton High School, and the 1950 edition of The Pines by Salem High School. 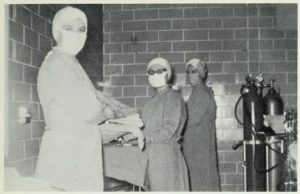 Students ready for the operating room in the 1961 edition of The Silver Cross. A bit of silliness in the 1960 edition of The Silver Cross. The Grace Hospital School of Nursing offered three year nursing degrees, and used Grace Hospital in Morganton, North Carolina as its clinical site. The Silver Cross yearbooks feature photographs of capping ceremonies and portraits of student in their uniforms. 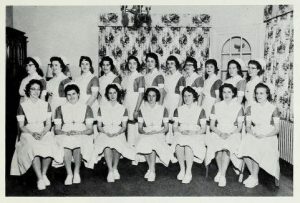 It also shows photographs of the nurses-in-training working in different medical departments at the hospital. To see The Silver Cross and the other newest yearbook additions, click the links below. To see more materials from Burke County Public Library, take a look at their partner page, or visit their website. 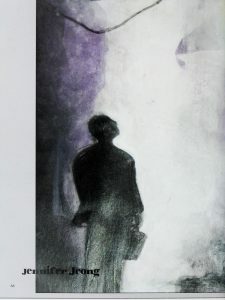 Yearbooks from our partner, the University of North Carolina School of the Arts, are now up on DigitalNC. These yearbooks span the years 1972 to 2016. Located in Winston-Salem, the UNC School of the Arts (UNCSA) is an arts conservatory that is part of the University of North Carolina public university system and serves high school, undergraduate, and graduate students. These yearbooks pertain specifically to high school program at UNSCA. Over the years UNCSA has explored a variety of aesthetics for their yearbooks. 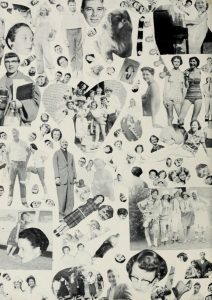 The yearbook from 1972 is reminiscent of an art catalog and features full-page black and white photographs of student art pieces and performances. The most recent yearbooks are more traditional and include student portraits, photos of student clubs and activities, and senior superlatives along with images of student art. To browse the UNCSA yearbooks, click here. To learn more about the University of North Carolina School of the Arts and see more materials, visit their partner page, or website. 5 editions of The Laurel, the yearbook from Mars Hill University, are now available on DigitalNC. These editions span 2012-2016 and join previously digitized copies of The Laurel dating back to 1917. Mars Hill University was founded in 1856, and is located in Mars Hill, a town in western North Carolina, 15 miles from Asheville. The University is home to around 1,200 students and offers 7 undergraduate and graduate degrees. 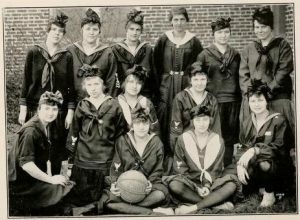 The most recent yearbooks document student life and activities, and include photographs of sports, clubs, performances, and events. Since almost 100 years of The Laurel have been digitized, it’s fun to see the differences from the most recent 2016 edition and the 1917 edition. 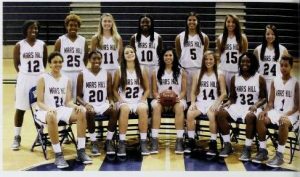 While the 2016 edition features glossy full-color photographs and shows a much wider range of academic and campus life activities, certain features, such as student portraits and photographs of sports teams, are present in both. To browse both new and old editions of The Laurel, click here. 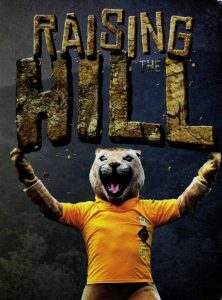 To learn more about Mars Hill University, take a look at their partner page or website. The 1963 edition of the Nuhosca by New Hope High School in Goldsboro, North Carolina is now on DigitalNC. This yearbook joins previously digitized editions of the Nuhosca from 1947-1966, all of which were provided by our partner, Wayne County Public Library. 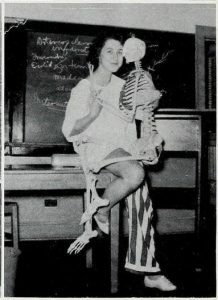 The 1963 yearbook documents goings on at school and includes school portraits, class photos, sports photos, and images of student clubs and activities. The student yearbook staff is a group that is particularly well-documented in this edition. 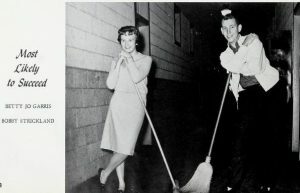 The 1963 Nuhosca has a two page spread enumerating different yearbook committees and showing some behind the scenes photos of how the yearbook was made. 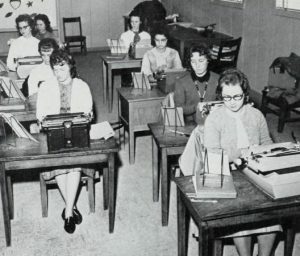 The student typing staff who typed all the work to send to the publisher is given a special mention, as are the photographers and ad committee. 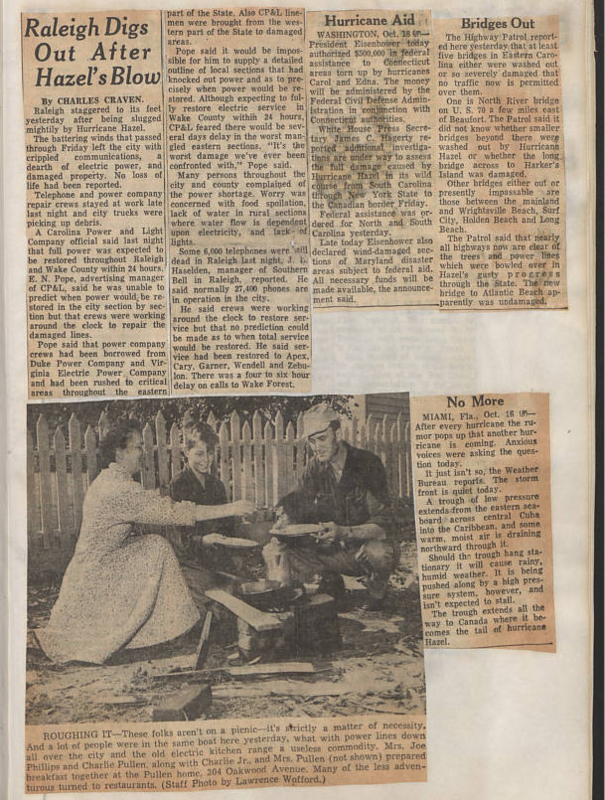 To see all the digitized editions of the Nuhosca, click here. To learn more about out partner Wayne County Public Library, visit their partner page or take a look at their website.